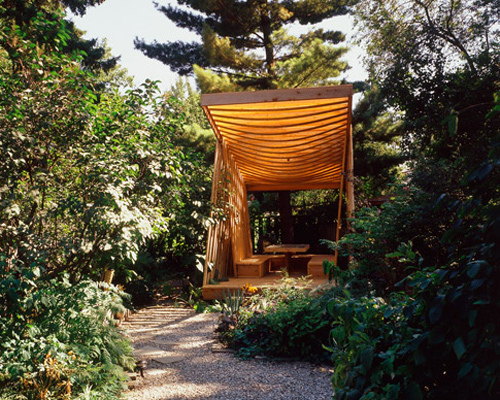 inspired by eastern philosophy, this small garden pavilion by paul raff studio is located in a private garden. made from cedar wood, the pavilion is based on eastern thoughts on harmony with nature. it has two seating banks and a table with a reflective glass top. the structure features lattice like elements that are interwoven to play with light and shadow. the design’s roofline is in perpendicular alignment to the sun at the summer solstice to provide the maximum degree of shading in the heat of mid-summer and also acts as a large-scale sundial. all together the unit measures 12 meters square.